On April 6, 1994, a plane carrying Rwandan president Juvénal Habyarimana was shot down near the country’s capital, Kigali, bringing a series of cultural and colonial tensions years in the making to a head, and setting in motion one of the worst mass killings in history. The Hutu government seized the opportunity to publicly blame the Rwandan Patriotic Front, led by exiled Tutsi Paul Kagame, for the assassination, and began a campaign to systematically slaughter the majority of Tutsis across the country. By July, International Red Cross estimates put the death toll at approximately a million people. In his latest novel, Road Trip Rwanda: A Journey Into the New Heart of Africa, Will Ferguson travels to the new Rwanda, contemplating past atrocities and marveling over the country’s reconstruction. Ferguson and his friend Jean-Claude Munyezamu, a Tutsi who escaped Rwanda just months before the genocide, take a road trip through the land of a thousand hills—visiting sites of genocide, open-concept prisons, and troupes of endangered mountain gorillas. 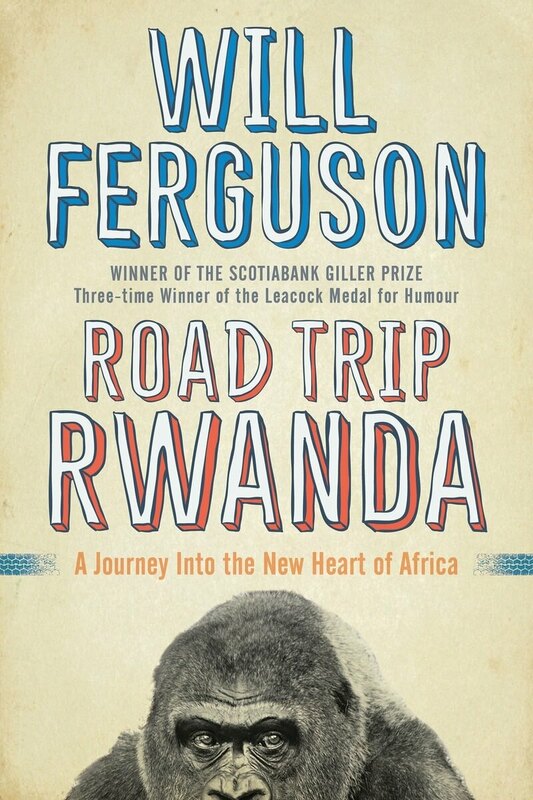 Reading Road Trip Rwanda is a bit like walking an emotional tightrope, but Ferguson never lets the reader fall, using his trademark humour to balance unfathomable stories of loss with inspiring tales of redemption. Miranda Newman: How have you been since winning the Giller for your novel 419? That was a pretty big year for you. Will Ferguson: I’ve been busy. When I won the Giller [in 2012], I was already planning the next book. I’d been really focusing on Rwanda and central Africa, so I didn’t have much time to let it sink in before I went spiraling off in another direction. I have professional ADD, I think. Road Trip Rwanda was as challenging and as big as 419. I always tend to bite off more than I can chew. Originally, I conceived it as a book for the twentieth anniversary of the genocide in 2014. Well, if you’ll check your calendar, it’s not 2014. I soon realized it was too big a project and too big a topic and I wouldn’t be able to move forward that quickly. MN: How did people react when you told them you were going to write a funny travel book about Rwanda? WF: When I told my friends I was going to write a funny book about Northern Ireland, they balked. They thought I couldn’t do it. I did. When I told them I was going to write a funny book about Rwanda, they threw their hands in the air. I don’t mean I’m going to write a book making fun of Rwanda—that’s not the same thing. Any long-distance trip when you’re out of your milieu, in a different environment, will bring forth humour. For me, travel is engaging and envelops you in another world. It can be heartbreaking and exhilarating, but it’s also often very funny because you’re out of your context—like when we went to find the source of the Nile and it turned out to be a puddle. To me, that’s funny and there’s no disrespect to the genocide in that. MN: What attracts you to the countries you write about? WF: I’m attracted to places that, in the public perception, seem frozen in time. Of course, they’re not. The people have moved on. When I travel, I want a country that has resonance, depth, and contradiction; but, also a country that’s beautiful. I love coastlines—I grew up landlocked in Alberta. I’m attracted to beauty in a destination, and I’m also attracted to countries that have gone through something. The resilience of the human spirit is quite remarkable. You see that in Northern Ireland. You see that in Rwanda. People still have these images in their minds that bodies are lying in the streets and the country is still reeling. Of course, you get there and people are living their lives. WF: I know. They all laughed and I was standing there appalled being a typical North American. It reminds me of the Cold War. Some of the funniest humour in the Cold War came out of people in the Soviet Union because humour comes out of a discrepancy between what we think and what’s real. When you live in that kind of discrepancy the humour is there all the time. I find Rwandan culture, like Northern Ireland, is reserved. Underneath both, there’s a kind of understated humour that I really like. There’s a shy openness, if that makes sense. MN: How does your Rwanda trip compare to the other places you’ve travelled? WF: This was different for me because I travelled with a friend. Usually I travel solo but, with Rwanda, I had no direct connection. My connection to Rwanda was a good friend of mine—Jean-Claude. It was his story I was retracing so we were going back to places that meant something to him. This was also the first time I drove. It’s great. Why did it take me so long to figure out the best way to travel is in a nice air-conditioned vehicle skimming along the back roads? Rwanda itself is a beautiful country. The first fact to know about Rwanda is not the genocide. It’s how physically beautiful it is. This is not a country that has been destroyed. It was wounded, it was on its knees, but it’s struggling really hard to reinvent itself and return to normalcy. I highly recommend Rwanda as a travel destination. I really do. MN: Has Jean-Claude read Road Trip Rwanda yet? WF: There’s really three stories in that book that I intertwined, or tried to. There’s the story of the genocide and the reconstruction; there’s my own story, which is comedic in a sense; and then Jean-Claude’s story, which is a bit of both. He read his part of the story because I didn’t want to make any errors. He was quite pleased and surprised I put everything in there. He didn’t realize travel writers are just like gargoyles. They just park themselves and watch. They’re these miserable people just watching other people having fun and keeping notes. For example, when he got to the part where we were driving through Muganda, the communal workday where everybody has to go out and help out once a month, Jean-Claude laughed. He felt bad that he wasn’t taking part and all along I was giving sympathetic nods and agreeing but in the book I confess, though I didn’t tell him at the time, I had no desire to go and dig a ditch. Until he read that, he didn’t know that’s how I felt. MN: At the beginning of the book, you mention that Jean-Claude is a Tutsi, and you have to do a mental calculation in your head of, wait, Who fought whom again? For readers who have an awareness of what happened, like you did, but not really anything beyond that—what do you hope they take away from the book? WF: I hope that they see the scope of it, that they understand what happened, and understand that it didn’t come out of the blue. I think that was the biggest thing to learn. I wanted to zero in on the root causes. To me, what really needed to be understood was the foundation of the genocide. How do you convince a majority of people to kill their neighbours? Sometimes, books just breeze over it. They say there were Tutsi kings, that the Tutsi had cattle and the Hutu were farmers. It always bothered me because that doesn’t seem like a basis to try to wipe out an entire population of people. There was thirty years of indoctrination and manipulation first. There’s a colonial legacy, there’s also a Rwandan cultural legacy. The thing that bugged me and took me the longest time to tease out and nail down was the foundation of the genocide. You’ll notice that I don’t really go into a lot of gory details. It’s enough to say women were chased through the swamps and hacked to death. Saying the Hutus were farmers, or the Tutsis were cattle owners, doesn’t tell enough. This genocide did not happen by chance. The other thing I wanted to express is that the two most remarkable things about Rwanda (and remarkable in the neutral sense) are the genocide and the reconstruction. It took me awhile to realize those aren’t in conflict. They come out of the same cultural traits. This is an old society that’s been there a long time and has deep roots. It’s a society that is goal-oriented. You have a problem; you have a solution. You work directly towards it. That can be used for good or for evil. If the solution is Rwanda needs gender parity, they’ll pass a law saying women must make up 30 percent of the boards of publicly traded companies. Solution. Done. Those traits can be used in a very positive way, but here’s the thing: it breaks down if the foundation is wrong. If the problem is the Tutsis are snakes and the Tutsis are cockroaches, then the solution is very clear: kill the Tutsis. It’s the same cultural foundation. MN: There are so many inspirational stories within the book: Tutsi children Jean-Claude helps escape from Rwanda, the warden who refused to execute unarmed prisoners, or the schoolchildren who wouldn’t identify themselves as Hutu or Tutsi when confronted by the militia. These heartwarming stories are born out of so much horror. Do you think it makes you a more hopeful as a result? WF: I think so. In Rwanda, you really do see the full gamut of the human capabilities. You see the absolute worst that humans are capable of and you see the best. The genocide casts a shadow over the entire country. It really is the big bang of Rwandan history. You can’t escape it, and you shouldn’t try to escape it when you’re there. Although the presence of the genocide is at times so overpowering, the final feeling you have when you leave Rwanda is hope. Not optimism. You have to distinguish between those. That was what I wanted the book to convey: a sense of the resilience of the human spirit and of hope. And hopefully it’s fun. It was a fun trip. There are many important sombre books you could read about Rwanda but I wanted to write something a little different and that was fun to read.